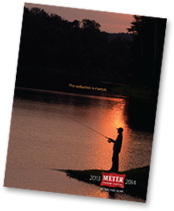 Meter Fishing Tackle is committed to the sport of fishing and if we weren’t making the finest fishing tackle, we’d be fishing. For over 50 years we’ve provided retailers and anglers the finest in fishing tackle. Meter Fishing Tackle was the originator of the famous Meter’s Original Bottom Bouncer and continues to this day providing the tried-and-true as well as the latest and greatest tackle. Today, Gary and Cheryl Strang are dedicated to enriching the fishing experience for countless people by helping to fill tackle boxes with the best tackle available. After all, fishing is good. Catching is better.